The Interior Dept. says officers have made thousands more arrests than in 2016. Immigration arrests at U.S. national parks and other federal lands spiked dramatically this year under President Donald Trump, with some 4,010 immigration-related arrests alone since May compared to only 126 arrests in 2016, according to the Interior Department. The figures represent a dramatic escalation in the immigration enforcement role played by the Interior Department, a federal agency better known for protecting the nation's historic monuments and wildlife refuges. The push also comes as President Donald Trump has deployed several thousand active-duty troops to the border in a push to deter illegal immigration, and as a Republican-led House committee considers legislation this week that would give border patrol agents greater access to federal lands. "The fact that we were able to increase arrests by almost 4,000 percent is undeniable proof that there's a big problem," said Interior Secretary Ryan Zinke in a statement touting the new arrest figures. "Under the previous administration, Interior's borderlands were basically an open door for illegal activity; and, what few law enforcement officers were down there were left unprotected and without the resources and backup needed to keep communities and themselves safe." 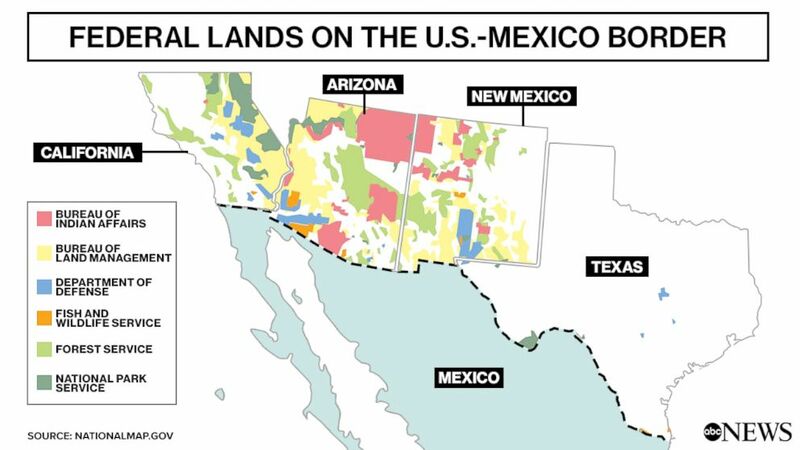 More than 40 percent of the land along the U.S.-Mexico border is federal land controlled by the Interior Department and U.S. Forest Service. In order to protect that land, the Interior Department employs more than 4,000 law enforcement agents - the third largest presence in the federal government. That number includes National Park rangers and U.S. Park Police, but also federal agents from the Bureau of Land Management, Fish and Wildlife Service, and Bureau of Indian Affairs. The Interior Department's primary mission is to protect natural resources in the parks, which can be damaged when too many people walk, drive, or leave trash. Law enforcement within the parks and monuments have an agreement to cooperate with agencies like U.S. Customs and Border Protection, which have complained in the past that restrictions intended to protect the environment made it more difficult to arrest undocumented migrants or stop routes for people entering the country illegally. CBP is the agency primary in charge of border apprehensions, arresting nearly 400,000 people near the border this year – a level on par with 2016 before Trump took office. According to figures released by the Interior Department, agents in national monuments and protected wilderness on the border apprehended and turned over 4,010 people to CBP custody and seized 2,356 pounds of drugs. An additional 469 people were eventually arrested outside of federal lands. 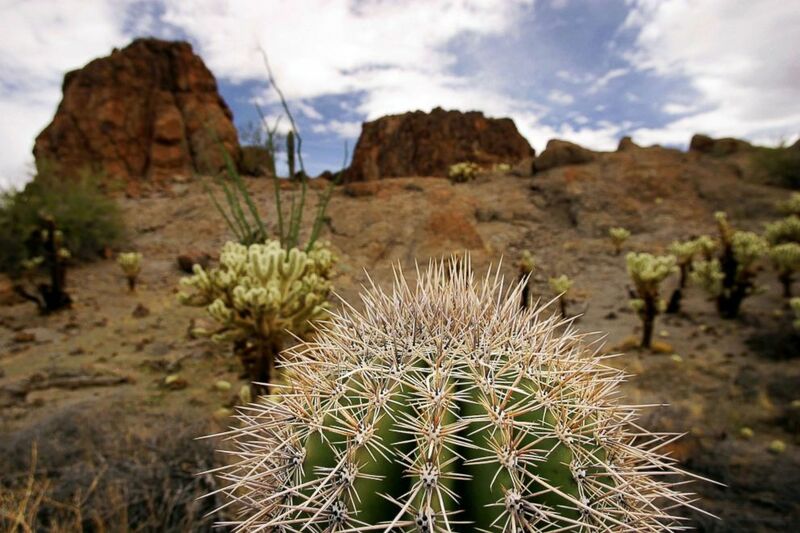 (David McNew/Getty Images, FILE) The top of a small saguaro cactus is seen north of the Cabeza Prieta National Wildlife Reserve, March 28, 2006, near Ajo, Arizona. Interior's new role as an aggressive arm of immigration enforcement could become a new focus for Democrats next year, who took control of the House in the last midterm elections. Rep. Raul Grijalva, the top Democrat on the House Natural Resources Committee, said he has been concerned that U.S. Park Police officers who typically patrol Washington, DC, New York and San Francisco, were sent to the border after Zinke announced a "surge" to the border last May. Grijalva asked Zinke then for more information on what the officers would be doing and whether other parks would be understaffed as a result. Grijalva's office said the congressman never got answers. The Interior Department cited security concerns when declining to provide ABC News figures on how many officers were sent to the border, where they are working or what they would be doing. "We have sought details from the Interior Department about their border activities and they have not been forthcoming," Grijalva said in a statement provided to ABC News. "There is very good reason to doubt their claims, just like there was good reason to doubt the president’s claims about the so-called caravan Republicans seem to have suddenly forgotten about." Grijalva represents Arizona which includes public lands like the Oregon Pipe Cactus National Monument and the Cabeza Prieta Wildlife Refuge. Multiple groups, including the Tohono O'odham Nation which lives in southern Arizona and Mexico, have said they strongly oppose what they call militarization at the border and want the military and parks law enforcement to step back. Before this month's elections, Trump made immigration his focus. He tweeted often about the dangers of a slow-moving caravan of migrants moving north through Mexico expected to seek asylum in the U.S. Last week, the administration announced a new plan to deter asylum seekers by refusing to consider applicants who cross the border outside a designated port of entry. (Corey Maisch/U.S. Army/Reuters) A U.S. Customs and Border Protection (CBP) agent watches while U.S. Army Engineers conduct site survey at a point of entry at the Arizona-Mexico border along the southern border of the U.S., Nov. 6, 2018. Darren Cruzan, the agency's head of law enforcement, said the Interior Department didn't dramatically change its policies this year when it comes to immigration. He said the agency has always played a law enforcement role in helping CBP enforce immigration laws. He said the uptick in apprehensions likely reflects Park Police and other law enforcement outfits "paying attention" to areas near border crossings. The agency, he said, is taking its cues from border patrol to identify areas where rangers should increase patrols. "Our priority is to protect the resources on DOI-managed land," Cruzan said in an interview. "So what we said is, 'Are there locations along the border where we are already doing our normal duties where we can be of assistance?'" U.S. border policy for decades has pushed people seeking to cross the border onto more remote, dangerous areas, which includes areas of desert that are managed by the National Park Service and other agencies. 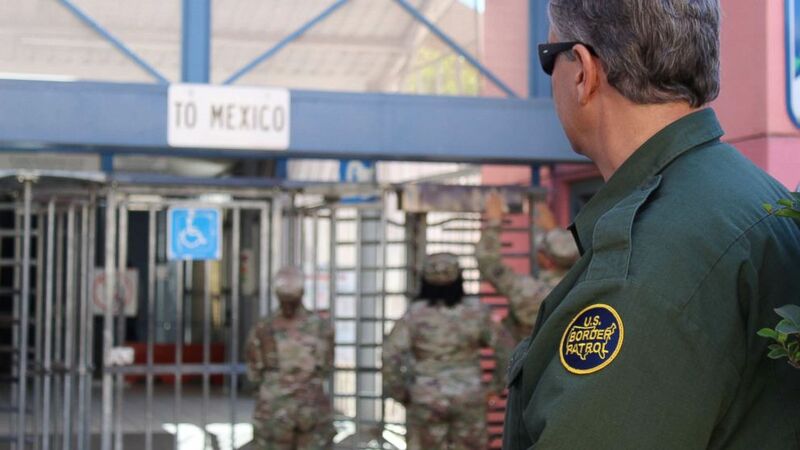 Border patrol officials adopted the strategy of "prevention through deterrence" in 1994 and since then, more agents and equipment have been stationed along the border to reroute migrants attempting to reach urban areas. But that effort to make it more difficult to cross into the U.S. illegally also resulted in more deaths among migrants, according to a 2010 government report and reports from advocacy groups. 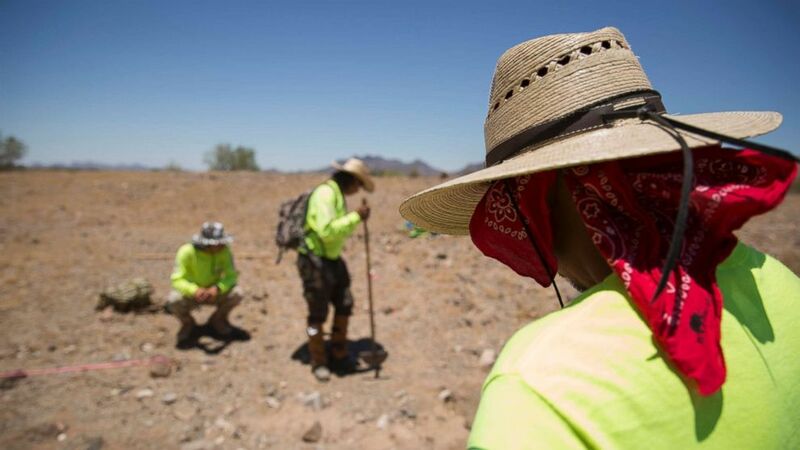 (Caitlin O'Hara/Getty Images) Aguilas del Desierto, Eagkes of the Desert, a search and rescue crew, mark off an area where human remains were found, May 27, 2017, in the Cabeza Prieta wilderness near Ajo, Arizona. In 2002, after a park ranger in Arizona was shot and killed by a man who crossed the border illegally, the Interior Department called for more focus on enforcing border security on federal lands. Still, the focus in recent years by the Interior Department hasn't only been nabbing illegal migrants. Fred Patton, a former chief park ranger at the Oregon Pipe Cactus National Monument, said park rangers were focused on stopping illegal border crossings but through an environmental lens because their primary mission was still to protect the land, visitors, and staff in the park. Patton said that during the mid-2000s, his park had about 10 to 12 rangers to patrol the 28 miles of border between Arizona and Mexico. Patton said its difficult to compare the number of apprehensions over time because it's influenced by other factors, including overall trends in migration across the border, other border security operations that might force migrants onto federal land, and the emphasis and resources on border operations within the department. But he said he's glad to see Zinke's support for the efforts on the border. “If the secretary of the Interior mandates that this is a priority, that trickles down all the way to the operations level,” he said. Zinke says the Interior Department is also increasing its law enforcement presence on the border in anticipation of the arrival of a caravan of migrants from Honduras and other countries. Some migrants that were part of the caravan are expected to reach the border near San Diego this weekend and some have arrived at the border in Tijuana.